THE first time I visited South Africa (the Republic) was in 1999, and the guys at the airport were still heady with the end end of apartheid – and to be frank, so was I. Unlike myself, they couldn’t help bringing up Idi Amin when they read my Passport, even though I felt I deserved better as a Ugandan. That entire visit I found that most people, including some random Zambian I met atop of Table Mountain, only linked the word “Uganda” to “Idi Amin” even though on interrogation I found that the Zambian HAD been to Uganda and met with serious Ugandans in the medical profession with no link whatsoever to our former President. This is not about Idi Amin. The excitement of his exclamation could have been linked to the expectation that he would catch me bringing in this agricultural contraband and therefore earn some commission or bonus, but after I calmly denied he slapped my suitcase and smiled. I smiled and went along my merry way since it was late in the night, but the memory came back to me the next morning. Through the years these icons have included enseenene (delicious tasting fried grasshoppers), which a number of South Africans find entertaining even though they and their cousins in Zimbabwe eat stuff like mopane worms; and Anne Kansiime who came up last year, proving the power and reach of our continental media. “She’s a funny one, that one! Tell her I said hi!” said the Immigration chap that night. At one point the icon they recognised most was our President, and I was relieved when instead of “Idi Amin!” they’d go, “Museveni!” This was about the time they seemed to learn about Uganda’s contribution to the apartheid struggle in the past. Most Ugandans don’t know about this even now. I recall meeting some young South Africans back in my much younger days in some dark place in Kyambogo. A few hours in we realised they were complicated characters when they introduced knives into an equation that involved liquids of a potent nature. The night ended without too much mayhem, and we didn’t become friends. Years later, I woke up in a dormitory somewhere and found myself face-to-face with one of those South Africans. He was back in the country to continue receiving the type of support that eventually led to these exclamations of “Museveni!” from his compatriots when I introduce myself as Ugandan. When I was leaving South Africa the last guy at the security checkpoint asked me about David Obua. I smiled and we chatted briefly about this Ugandan. This week’s declaration of “Matooke!” pleased me, and along the way I asked a few other South Africans about their knowledge or liking of the foodstuff – at least three of them confirmed it. This is not about Matooke. The fact that we have positive sounds about ordinary things like enseenene and Matooke means we have lots more to offer the world than we realise or make use of. Our Ambassadors and Tourism afficionados could keep us notified what these icons are so we take advantage of them at every turn and corner. If Matooke is the big thing from Uganda in South Africa in 2017 then every Ugandan flying down there could go with a recipe book and a sample packet of matooke crisps or something even more innovative, and sell more Uganda out there. it is you – Uganda – so take what is yours! MY neighbourhood in Kampala is quite active when it comes to community issues. In recent months, the range of issues has included road safety and personal security, both of which featured groups of skaters that nobody could readily identify as either residents or friends of residents. We have had varied views about the skaters for a while – some more vehement than others. And this week, immersed in a totally unrelated conversation many kilometres away from my neighbourhood and the skaters, I was relieved that no drastic action had been taken against the skaters. The kaboozi took place within the KFM studios as I was waiting for a talk show to commence. One of the producers there, Sean Oseku, mentioned a skating ramp in Kitintale and went on with what he was saying but I failed to follow him. “What do you mean ‘a skating ramp in Kitintale’?” I asked, incredulous. The skaters in my neighbourhood do not use a ramp; their high nuisance rating by some neighbours was partly because they were skating right on the road itself and presenting accident risks for motorists. “There is a skating ramp in Kitintale…” Sean told me, and then gave me directions that really surprised me. He was talking about my neighbourhood skaters! They had a ramp?! I normally see skating ramps in movies and countries like the United States where youths are encouraged to participate in such sports especially in communities where deliberate efforts are required to stop children being idle, because the adage says that gets the devil working. The last time I saw one, though was at an event in Kololo, Kampala, when the Mega Dairy people erected a movable ramp as part of their stand next to mine, complete with child skaters. That had impressed me, and excited all the children in attendance. And as Sean continued his tale he mentioned that Moses Byaruhanga, Presidential Political Assistant and proprietor of Mega Dairy, was one of the benefactors of the skaters – the Uganda Skateboard Union. Marvelling at how small the world was turning out to be, I flicked open my tablet and sought out the actual topic of conversation. Out there in the big, wide world is a musical hit doing quite well on the global charts that has garnered more than 1.8million YouTube views so far. The song is “Should’ve Been Me” by Naughty Boy, Kyla and Popcaan. 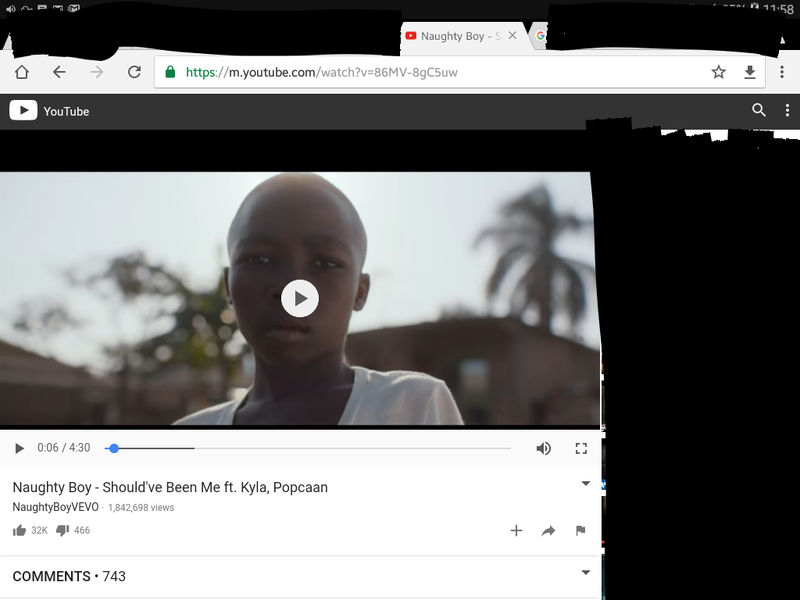 Right from the opening shot of the video I knew Uganda was involved. The little boy in the frame made me think immediately of Madina Nalwanga, of ‘Queen Of Katwe‘ fame. The rest of the video just finished me – including the bits shot in my neighbourhood! There is something happening around and about Uganda that is giving us global prominence in a way we are almost not ready for. We need to wake up to what it all means. The entire video is a cinematographic feel-good, dreams-can-come-true, triumph-amid-tribulation four and a half minutes that hits the mark dead-centre. It is Disney-ish yet not Disney. We have dust but also tarmac. We have poverty but hope and energy. Big boys give way to small boys, and encourage them. Even signs of menace turn out to be caring protection, as the Uganda Police characters in the shot are kindly guarding skateboards overnight. There is something about Uganda, that would make these musicians choose to focus their entire music video on this place. We need to wake up to what it means. Our conversation that evening traipsed around how Uganda keeps getting these big and small bits of admiration, acknowledgement, accolade and affirmation. We need to do more of it ourselves, and celebrate the good stuff we have. And when others do it for us, we need to learn how to take the advantage they so readily give us. Wondering about the value of this small opportunity? To advertise on YouTube for 1.8million viewers would cost a minimum of US $180,000 (Ushs630million). The song was only released in November 2016, and the video in December, so these are early days yet. In European charts alone the song has reached popularity in Belgium (35 on the singles charts), Hungary (33), Ireland (95), Scotland (47) and the UK (97). Let’s not wait a few more seconds, minutes, days or years then start crying “Should’ve Been Me”. It is YOU, Uganda! Take the advantage!